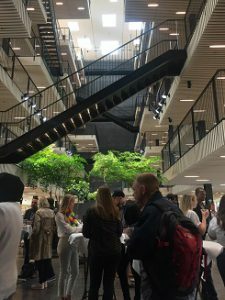 Last week saw the completion of two major innovation initiatives in Copenhagen: The Upcycle Challenge and Copenhagen Fintech Week. Both programmes embraced open innovation – powered by Wazoku’s Idea Spotlight. The first to crowdsource ideas from the general public to revolutionise the sustainability of the construction industry and the latter to engage the most exciting startups in Copenhagen to pitch for awards and launch a challenge for CARE International. 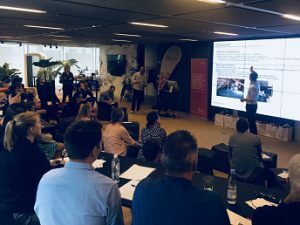 The Upcycle Challenge – an open innovation campaign to crowdsource sustainable solutions to reduce waste from the Danish construction industry. In Denmark the building industry is responsible for 30% of society’s waste – and the industry uses more than 40% of domestic resources. A firm acutely aware of this problem was Enemerke and Petersen (EOGP), one of Denmark’s largest construction firms, who resolved to finding a solution from the general public. EOGP teamed up with Bloxhub – an urban innovation hub that brings together companies, organizations and researchers to co-create solutions for better cities – and together they approached Wazoku-partner Danish Crowdsourcing, to run an open innovation challenge: The Upcycle Challenge. The aim of the Challenge was to inspire the public to find sustainable ways for the construction industry to ‘upcycle’ waste materials. With prizes for the top three ideas, platform activity was high as hundreds of people engaged with the Challenge to help solve this societal problem. The Challenge ran for six-weeks and built up a large crowd on the platform who, along with comments, suggestions and voting, provided 52 ideas. Using the platform’s functionality, these ideas then went through a basic evaluation, by EOGP, followed by an external evaluation, to reduce the list down to the top five ideas. These five finalists, which included architectural firms and students, then pitched their ideas to an expert panel in the futuristic river-side Bloxhub building in the centre of Copenhagen for their chance to get their hands on the 30.000 DKK prize (about £3,600). Amongst the finalists was an Egyptian student who pitched remotely via video from Cairo! The winning idea was from architectural firm, Krydsrum Architects, wanting to change the way wingtiles, slate, bricks and gables and other materials are discarded when roofs in a city are replaced. With their innovative solution, “Reskur” (Reshed) they proposed using the discarded materials to build new sheds for storage, bikes and garbage disposal. The runner up idea, titled “GREY TO RED | Upcycling of bricks as cement replacement in building components” presented a method to use finely crushed bricks as a cement replacement. The idea proposed a simple way to lower the volume of cement used in concrete based building components, without compromising the mechanical strength of the concrete itself. The event was a great success and resulted in over 50 great ideas to transform the industry. Take a look at all the ideas submitted. 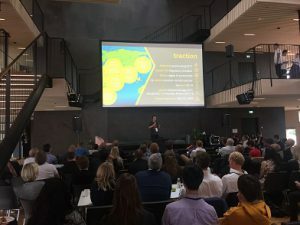 With pitches from 29 fintech startups, talks from a host of leading tech experts, and panel discussions on a range of the most innovative fintech topics, the CPH Fintech Week was a hive of excitement and opportunity. A way to connect its 170 entrepreneurs within the Lab, provide a central information hub and capture and develop fintech ideas. To launch an open innovation Challenge for CARE International. For a range of award-winning innovative startups to apply for different awards and to gain visibility from potential partners and investors. The week featured talks and discussions from industry experts including Ewan Macleod (Chief Digital Officer, Nordea), David Rasson (Center of Expertise Lead Innovation, ING) and Frederik Eriksson (Fintech Lead – Nordics & Baltics, Amazon Web Services), discussing a range of exciting topics including corporate-startup collaboration, fintech disruption, cybersecurity, the future of cloud services, and blockchain and AI in fintech. Prior to the event, applicants could be nominated for or apply directly to different awards (Impact, Scale-up, New Start-up, Corporate Innovation, Innovations System) on Copenhagen Fintech Virtual Lab, powered by Wazoku. Nominees were then evaluated by a panel of judges on the platform and the top fintech startups then pitched to the crowd of sponsors, investors and corporates. The event was sponsored by market-leading firms including AWS, Skandia, Danske Bank, Nordea and Saxo Bank who turned up in force to soak up the excitement and catch the latest ideas coming out of Copenhagen Fintech Lab. A particular highlight was David Rasson’s talk on ‘Corporate – Startup Collaboration: How ING is fostering innovation and startup culture’, announcing that, “at ING, we are looking for the moon shots”. A brilliant and inspiring week, fantastic to see our platform enable such ambitious innovation, and we wish the startups the best of luck! At Wazoku we’re saving the world one idea at a time. Start your own sustainable development initiative powered by Wazoku.